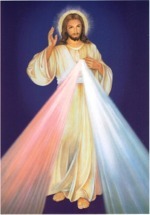 The Association Apostles of Divine Mercy with Mary Queen of Peace is a private Association of the lay faithful, born of a spiritual journey made in Medjugorje. The Association was founded in 2004 in a small church which is located 8 km from the parish of Medjugorje (Šurmanci) entitled to the Divine Mercy which houses an icon of Jesus the Merciful much venerated. The church depends on the same parish of Medjugorje. The Association was founded under the inspiration of the Founding Father, Father Francesco Maria Rizzi OFM (President of the Association) during a prayer meeting.